Marvel is pleased to announce that Uncanny X-Men #488 and X-Factor #21 have both sold out at Diamond (though copies may be available at the retail level), marking the fourth straight sell-out from the red-hot Endangered Species storyline. With mutantkind heading towards extinction, the X-Man known as Beast struggles to reverse this deadly course, seeking out some unexpected allies in the process! This story unfolds weekly in the pages of Uncanny X-Men, New X-Men, X-Factor and X-Men, with each eight page chapter featuring some of Marvel’s top talent bringing this gripping tale to life. 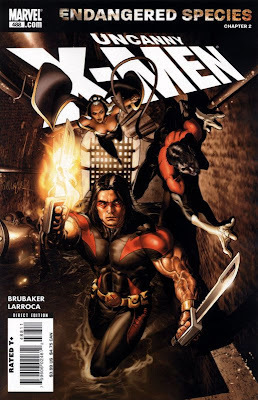 As Beast deals with this crisis, the Uncanny X-Men and X-Factor have their hands full with emerging threats that seek to eliminate a few more mutants! In Uncanny X-Men #489, the quest for Magneto continues as both Masque and the X-Men hurtle towards the truth! While the Morlocks continue to commit acts of terrorism, Storm enlists the aid of some “Fantastic” friends to make sure the violence ends! Meanwhile, X-Factor #22 brings Madrox’s agency one of their most unusual cases: protect two young singers…who sing anti-mutant songs! While Siryn and Monet must find a way to deal with this challenge, the Isolationist continues his quest to create a mutant utopia…but at what cost? In future chapters of Endangered Species, Beast will travels to lands—and dimensions—where few else dare tread…and cross paths with the one enemy who knows him best! Leading into this fall’s Messiah Complex, Beast’s journey will lead to a shocking new status quo for the X-Men! Don’t miss a single chapter! Please note there are currently no plans to reprint Uncanny X-Men #488 and X-Factor #21.